As much as I love the gin renaissance (or ginaissance) that is happening up and down the UK, I can’t help but hark back to times gone by when gin was the drink of choice for the well to do men and women of the early 20th Century. I love all the glitz and glamour of the Gatsby era and if it wasn’t for the small fact that women had very few rights (let’s not get all feminist here…) I would have loved to be a part of it. With that in mind, I’ve been trying to mix together some more classic gin cocktails. You may have seen my Limoncello Gin Fizz, the Sour Cherry Gin Sling or even my Blood Orange Gin Fizz. But what I’m currently enjoying are classics like the Martini, Gimlet or the White Lady. My favourite classic cocktail of all, however, is the Negroni. There’s no official story behind the creation of the negroni but there is one thing that most people agree on and that’s how to make it. While Jon and I pride ourselves in having a ridiculously large alcohol collection it just doesn’t include vermouth or Campari so to get my Negroni fix I’ve moved on to something a little different, a high end pre-mixed version of the cocktail. The idea behind their Vintage Cocktail range is pretty simple – beyond just taking money from lazy folk like me – you get all of the taste of a high end, classic cocktail as if it has been mixed by a master mixologist with minimal effort. All you have to do is open the bottle, pour over ice, stir and then garnish with a twirl of fresh orange peel. 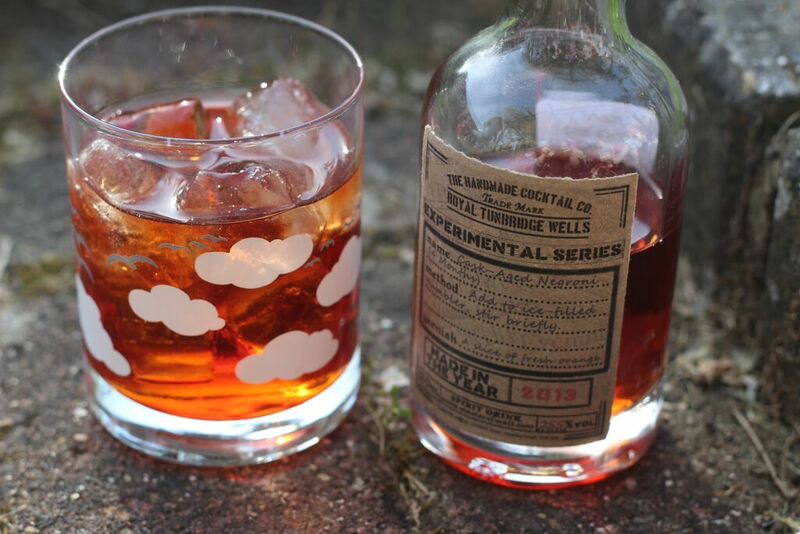 To make this pre-mixed Negroni the Handmade Cocktail Company have used a meticulously calculated blend of English copper pot-still gin, sweet vermouth and bitters. It’s clear that they have used only the best ingredients. 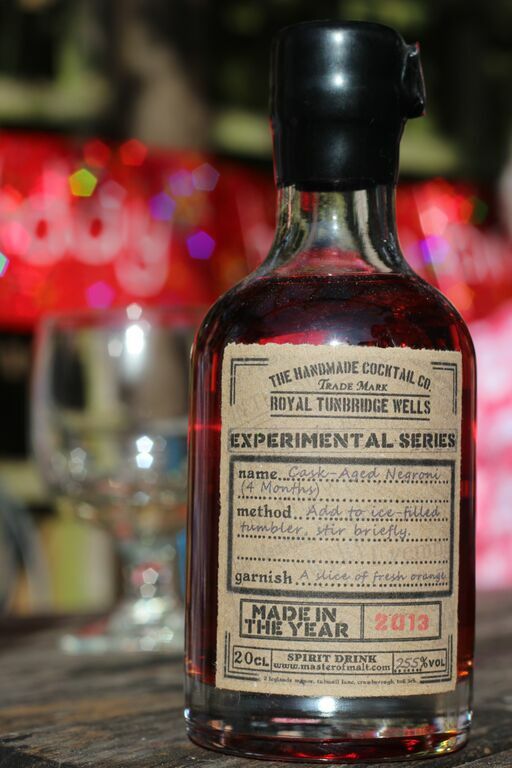 So you’ve bought yourself a bottle of the Cask Aged Negroni (4 months). What does it taste like? There’s no right or wrong when it comes to tasting a drink. The other half is more in tune to tasting whiskies so what he could taste was a little different to what I could. I’m not sure if his palate was more sensitive or whether mine was just more accustomed to gin but there were some points we could agree on. The following are some of my thoughts when smelling and tasting the Cask Aged Negroni (4 months) from the Handmade Cocktail Company. On the nose: warm winter spices (vanilla, cinnamon), rich / stewed berries, plums, damson, sloes. On the tongue: quite spicy / peppery, thick and oily, more like a sloe gin or red wine, well rounded and smooth. At the end: long, soft fruity note, figs, plums, vanilla. Overall this is really quite a mouthful! It’s very well rounded and has a soft, smooth finish. They are all quite different so it’s hard to say which one you should plump for. Personally, I think the Cask-Aged Negroni (4 months) is awesome, and at £14.95 (albeit for a small bottle) you can afford to give it a go and see what you think. If you’ve tried one of the Negronis or any other cocktails from the Handmade Cocktail Company I’d love to hear what you thought! Perhaps we can compare notes?! Happy Friday everyone! *Disclosure (of sorts): yet again I bring this review to you out of the goodness of my heart. At no point have I been contacted by the Handmade Cocktail Company or Master of Malt and either asked, or paid to say good things about them. I bought the Cask Aged Negroni (4 months) myself and loved it so much I just had to share – cheers! I haven’t heard of that website so I will definitely be checking out their selection. Hi Helen! It’s now my go-to when I want to order specialist spirits, particularly whisky and gin! They often have limited edition bottlings you can’t get else where! That Negroni sounds delicious and the lovely deep colour is very appealing. I’ve never tried a negroni but it sounds like something I’d probably like so thanks for sharing more of your love of gin based cocktails! Hi Jen – I thought you might like this 😉 I’m always happy to share my love of gin!!! I’m a huge G&T fun, particularly of all the Scottish Gins but I’ve never tried a Negroni. Must rectify! Definitely Claire! Scotland does have some fantastic gins which would taste GREAT in a negroni!!! This looks fabulous! I love the bottle too. Will definitely try a negroni next time I’m out for a drink. They are delicious but potent 🙂 my favourite 😉 i agree the bootle is beautiful too 😀 I’ve saved it! That is such a good idea to provide a mix as I don’t have campari or red vermouth either. I might need to invest….